Let's face it the majority of us would rather pull teeth than visit the second page of Google search, 83% of us to be exact. So what do we do if viewing page two is out of the question? Seeing this behaviour Google has always been an advocate of search suggestions. Google suggest auto-complete has been aggressively used by users while SEOs have been using for years to extract valuable semantic keyword data for years. Following that was the release of the hummingbird algorithm to help with long tail queries and give users better search results. Secondly, as of 2015, Google has announced that 10 countries have already shifted to driving more mobile searches than desktop searches. A trend that is beginning to spill over into other markets. This is also being supercharged in emerging countries. Where access to the internet is driven predominantly by the high adoption and easy entry to market of affordable Smartphones and Tablet PCs. Armed with the information I've just mentioned and Google always being proactive is testing a new look for that on the mobile search interface. The introduction of a new look related search carousel on mobile SERPS is cleaner and more boxed-in. It also scrolls left and right, to allow for multiple search queries to be displayed. 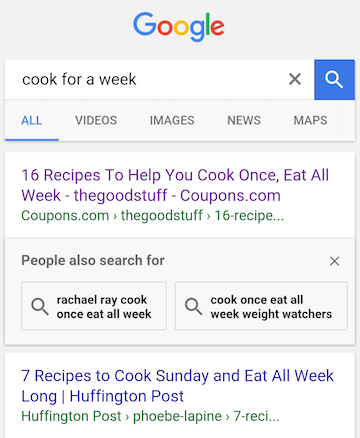 When a user performs a search on mobile, Google will now provide users with related search terms or topics. The topics are pulled through to SERP from its algorithms and indexing matches for the most popular searches around that given topic. This could mean users will be spending more time on Google, drive more bias to the top 10 search results, increase pogo sticking, reduce visits to page 2 of search results and also mean thin content or poorly optimised content will continue to be demoted. It could also mean businesses and content producers will need to look at producing more keyword rich content, that answer multiple questions and drive value for multiple search terms. These are only educated guesses on our part for now. We'll continue to monitor the introduction of related searches and how it will affect future mobile search behaviour.